In recent years, the Gulf of Aden, between the northern coast of Somalia and the southern coast of Yemen, has become a hot bed for acts of piracy. Of the 293 reported acts of piracy and armed robbery against ships in 2008, 92, nearly 32%, occurred against ships traveling those waters. Multiple international shipping lanes cross through the Gulf of Aden as ships transit in and out of the Red Sea and into the Suez Canal and Mediterranean Sea, or into the western Indian Ocean. The area is also a major transit route for the world’s petroleum supply, with 11% of all seaborne oil transported through the Gulf of Aden. With pervasive underdevelopment, shortfalls of humanitarian aid and foreign assistance, rampant violence, and lack of domestic governmental control, the population of Somalia has necessarily turned to illicit means for subsistence. One of those means is piracy, which has become a lucrative industry, generating an estimated $50 million in 2008. 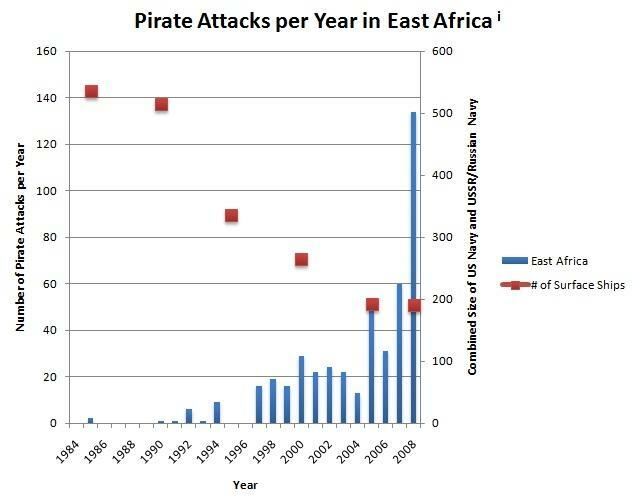 With a per capita GDP of only $600 in Somalia, the piracy business appears very attractive. Pirates operate with the goal of hijacking commercial vessels and either kidnapping the crews, or holding the vessels and their cargos for ransom. Typically operating from larger control ships these pirates deploy in smaller, faster powerboats to “swarm” and board the commercial vessels they intend to hijack. Although they typically employ a small force, the pirates are quick, mobile, and usually heavily armed. Their speed and firepower typically overwhelm the minimal crews of commercial vessels which normally travel unarmed. The hijacked vessels are typically piloted back to a pirate-friendly harbor or port facility in Somalia where they are held until ransom is paid. First, directly combat and deter acts of piracy in the Gulf of Aden, through the use of force. Second provide sufficient development assistance to build Somalia into a self-sustaining economy with legitimate governmental control. Considerable efforts have already been made to combat the pirates off the coast of Africa. The US has sponsored an international armada aimed specifically at counter-piracy operations, which are known as Maritime Security Operations (MSO), in the area off the Horn of Africa. Combined Task Force 151 (CTF 151), created in 2007, comprises naval vessels from the US 5th Fleet, and nearly twenty other countries, mostly NATO allies . Even naval forces of the People’s Republic of China have deployed to waters in the area in an effort to combat the threat, albeit only after a Chinese-flagged commercial vessel was hijacked by pirates. Nevertheless, with the U.S. military engaged in other theaters of combat, additional military operations are likely viewed with trepidation by the public, challenging the apparent consensus to act. If the international coalition, which has already formed behind the issue, can be organized into a cohesive and effective force, however, concerns about the United States having to ‘bear the burden’ of action will be reduced, thus solidifying domestic consensus and negating opposition to military operations. With almost 300 vessels being subjected to armed attacks, and attacks by Somali pirates, something must be done to combat the threat posed to maritime security. Development measures must be taken onshore to dissuade Somalis from partaking in illicit acts altogether. While the timeframe for development will be measured in years, even decades, the need for increased protection of commercial vessels is immediate. Some measures have been taken, but much remains to be done. The further development of the international anti-piracy coalition is critical to these efforts, but will have the overcome the traditional limitations of multilateralism – procrastination, buck-passing, and lowest common denominator policy responses – if it is to have any chance of success. United Nation, Division of Oceans and the Law of the Sea. Available here. ICC International Maritime Bureau, Piracy and Armed Robbery Against Ship: Annual Report 2008. January, 2009. London. 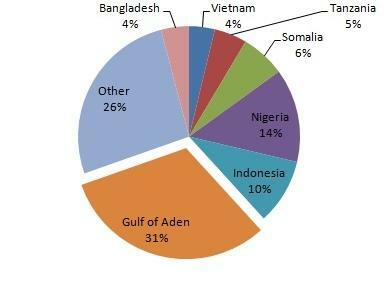 International Tanker Owners Pollution Federation, Regional Profiles: Red Sea & Gulf of Aden. 2003. Data compiled from: Russian Navy: GlobalSecurity.org, “Russian Warships”, accessed June 17 2009. Available here; US Navy: Naval Historical Center, “U.S. Navy Active Ship Force Level 1917-,” accessed June 17 2009. Available here; Pirate Attacks 1984-2005: Martin N Murphy, Small Boats, Weak States, Dirty Money: The Challenge of Piracy, (New York: Columbia University Press, 2009) p. 63. Pirate Attacks 2006-2008; ICC International Maritime Bureau, “Piracy and Armed Robbery Against Ships: Annual Report 1 January– 31 December 2008,” January 2009. p 26. USAID: Somalia, October 28, 2009. Available here. Somali Pirates Are Getting Rich: A Look at the Profit Margins, April 15, 2009, Time.com, Available here; “Somalia”, Cia.gov, Available here. United States Navy, “New counter-Piracy Task Force Established”, January 8, 2009 Available here. Canada.com, “China to Send Fresh Anti-Piracy Naval Convoy to Gulf of Aden”, October 30, 2009.Available here.